For those of us in that vast portion of North America that has remained snow-free for most of the year, the idea of a snow monster haunting the frigid landscape outside the safe confines of our homes seems a bit abstract. But in Japan, it is a very real prospect, that is if you consider oddly shaped trees to be your kind of nightmare. 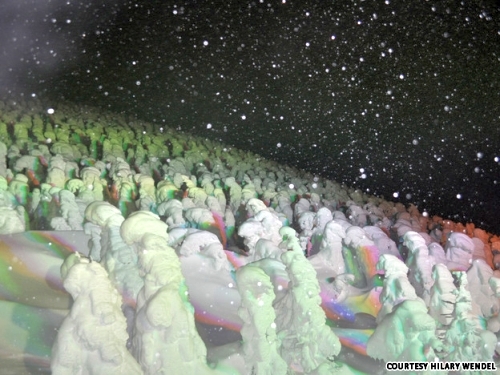 CNNGo has this slideshow of the so-called Snow Monsters of Zao in Yamagata Prefecture. In reality, the snow monters aren’t all that scary. They’re just Aomori fir trees “that have been coated with extremely wet snow and ice carried by a cold Siberian jet stream that also freezes them almost solid” into odd human-like shapes. Not exactly the scariest thing you’ll encounter in Japan (that will probably come in the form of the “dancing squid” meals you have later on), but a great sight to see nonetheless. Take that Matterhorn Yeti!